Originally the Nattukottai Chettiar community hailed from a city called Chettinad in Tamil Nadu. Basically, they belong to one of the outstanding wealthier business communities in South India. It was said that originally Chettinad consisted nearly ninety-six villages, but with the passage of time, due to the emigration of the Chettiar population from the Chettinad land, the total number of villages in the Chettinad was reduced to seventy-five. Despite its glory and prosperity, the land belongs to the dry zone which must be one of the major drawbacks for the occupants of the land. Maybe this is one of the major causes which might have forced this particular community to take refuge in different parts of India as well as in the neighbouring countries. This particular community with the passage of time migrated from their native South Indian city of Chettinad to numerous other regions of South India and other South East Asian countries. During the 19th century, they migrated to Sri Lanka, Burma, Java, Sumatra, Malaysia, Singapore and Vietnam. Devokoatti and Karikudi are the two major towns in the Sivaganga District in Chettinad. It is stated that the majority of the Nattukottai Chettiar community migrated to Sri Lanka from the above mentioned two towns in the 19th century. This particular community not only played a significant role in the economic and social spheres of Sri Lanka but also played a considerable role in the religious and cultural spheres. Generally, the members of the Nattukottai Chettiar community are ardent devotees of Lord Murugan. It is worthwhile to mention here that wherever they migrated they never failed to carry their distinct culture, tradition and religious faith with them. But it should be remembered that wherever the Chettiar community migrated they always maintained their strong links with their native homeland Chettinad. They especially preserved their cultural and matrimonial ties with their own native villages in Chettinad. Their migration took place mostly in the early part of 19th-century and wherever they migrated they carried their religious and cultural footings in the alien lands. Wherever they settled they had the habit of building magnificent Lord Murugan temples with excellent Dravidian architecture. Still, this evidence could be witnessed at the Colombo Sea Street. In yesteryear, the Sea Street of Colombo was generally called Chettiar Street. The present location of Colombo Sea Street is referred to as Chettiar Theru in Tamil by the Tamil population. The term ‘Chettiar Theru’ means that the majority of the dwellers or the occupants of the street were Chettiar community. It is one of the noteworthy facts to be mentioned here that this particular community deeply cherished the Hindu religious and traditional values. The Chettiar community cherished the Murugan cult in Hinduism. They had the habit of building a chain of Murugan temples in their migrated lands. 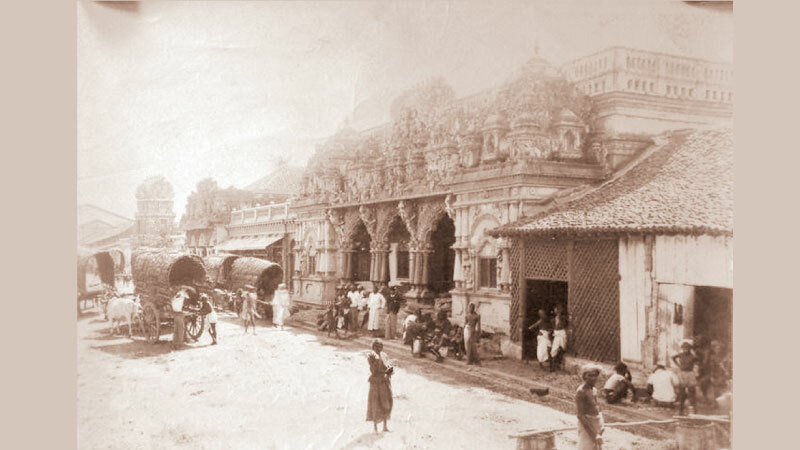 Most of the excellent Hindu temples which are presently seen in Pettah were built by the Nattukoatti Chettiar community of yesteryear. 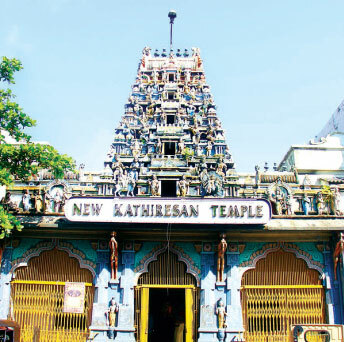 The majority of the Nattukottai Chettiar community left Sri Lanka during the period of the 1950s, but the temples built by them stand as strong evidence for their immeasurable contribution to Hinduism in Sri Lanka. According to certain historical evidence, the Chettiar community first of all came and settled in the Galle District, but later shifted to Colombo and other parts of the country. The Nattukottai Chettiar community is also known by another name Nakarathar community. Among the local population, they enjoyed a prestigious position. One of the outstanding features of the Nattukottai Chettiar is wherever they migrate; they adjust themselves with the local population and become an integral part of that society. This wealthy community has the capability of establishing themselves with the existing local population. They usually establish strong links with different sections of the local public. The main intention and aim of the Chettiar community are to strengthen and secure their business interests in the migrated lands. As far as Sri Lanka is concerned, they established themselves in different parts of the country such as Anuradhapura, Polonnaruwa, Jaffna, and upcountry, Tissamaharama, Galle and Colombo. The main profession of the Nattukottai Chettiar community was money lending on nominal interest rates. In other words, they were the first to introduce the money lending business to the people of Sri Lanka. The tactics of Nattukottai Chettiar community in money management was unique. With the passage of time, they gradually gained popularity among the local population of Sri Lanka. They also introduced the pawning business to Sri Lankans even before the establishment of commercial banks. The methods they adopted in financial transactions got much more recognition and popularity among the local population. Gradually they gained more popularity among the local population of Sri Lanka, especially during the 19th century.